Tangerine is an outdoor cat who was "adopted" by a cat loving woman in Chapel Hill. Tangerine didn't show up at her normal feeding times for a few days in a row and the woman started getting worried. Meanwhile down the road a mile or so, a man kept hearing faint cat cries while he was outside. He followed the cries and located a cat 70 feet up a 90 tulip poplar tree. 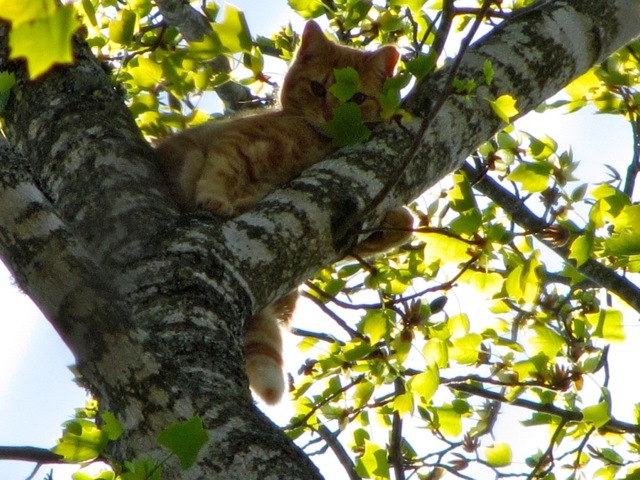 I got a call from the man asking for help, but neither of us yet knew this cat was Tangerine. 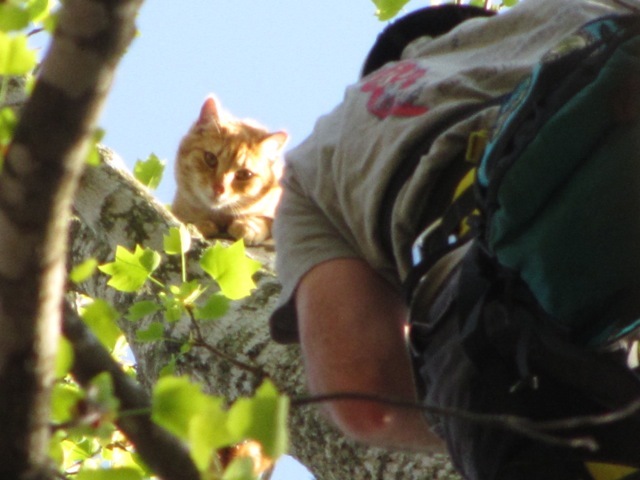 Things seemed to be going well during this rescue – the cat wasn’t scared of me, it didn't try to move higher or further from the trunk as I approached, and when I opened a can of cat food and put some on my outstretched hand it sniffed, licked its lips, and stretched a little closer. When I went to make the grab however, things took a turn for the worse. The cat tried to jump and I was only able to get a weak hold on its tail. As I tried to get a better hold on the scruff of its neck the cat wrenched around and sunk its teeth into the side of my hand. I jerked my hand back and lost the grip I had on its tail with my right hand. The cat fell 70 feet and landed with a terrible thump on the forest floor. In the same instant the cat hit the ground it bolted and was soon totally out of sight. Because of the deep bite wound and because the cat's vaccination history was unknown, I learned after talking with animal control that I would need to start a very expensive series of rabies shots within 3 days of the bite unless the cat could be located and quarantined. Life was turned upside down for the next three days. I enlisted the help of an animal control officer, the neighborhood homeowners association, and a handful of gracious individuals wiling to go door-to-door with me to distribute "have you seen this cat" flyers. Just as hope was beginning to dim and with less than an hour before I was planning to initiate the costly post-exposure rabies vaccine series, we located Tangerine and made a positive ID with the help of her owner. Thankfully, the owner had had Tangerine vaccinated against rabies previously so I did not have to get the shots.